Season eight of Comedians in Cars Getting Coffee comes to a close this week. While John Oliver made Donald Drumpf again, he could not follow up the wondrous Lorne Michaels. That’s not to say Oliver was bad. There were some funny moments worth rewatching. I’m just not sure anyone could truly outdo the immortal Lorne. In the open, host Jerry Seinfeld informed us this week’s car wouldn’t make any sense. And it didn’t. There was even a cool newspaper graphic to help illustrate this issue. The Triumph TR3A sits closer to the ground and it was a very white (specifically, pearl white) car with a black top and black interior. The speedometer doesn’t go very high and the car doesn’t exactly look powerful, but it has wire wheels and knock-off hubs. To me, wheels like that are made for street racing. In contrast, the body is for someone who doesn’t race but wants people to think they race. And maybe that’s John Oliver, a man who pontificates on a weekly basis for HBO but — unlike Bill Simmons — doesn’t look out of place on television. He isn’t American, but he comments plenty on American politics and issues. Once Oliver gets to the car, his hat comes into full view. It’s a New York Mets baseball cap, which is the most American thing a British person could wear. The conversation starts off pretty serious with Oliver talking about his wife’s time as a combat medic after 9/11. He mentions how his wife joined the very next day and makes sure that point is very clear. It elicits a “How stupid do I look?” response from Seinfeld. Afterward, the two comedians talk about Oliver’s HBO show, Any Given err, Last Week Tonight. Seinfeld tells him it is just Oliver talking to a camera, which is exactly how one of my friends describes the show. I do not watch the show because I don’t get HBO, but I do own a “Make Donald Drumpf Again” hat. I wore it in public once and found out the human face can be manipulated in ways I’d never seen before. Seinfeld was on fire during this episode as he had two more funny lines during the car ride. The first was about Orthodox Jews and hipsters looking alike. It’s completely true, but I never noticed the similarities before. He also perfectly summarizes the American viewpoint of a British accent. Back to the guest… and the restaurant segment. It’s interesting that Oliver once did a stand-up gig to a room that was slowly emptying. And it was emptying so quickly that 25 minutes in, the room was completely empty. A gig like that would make me want to completely quit comedy. But Oliver didn’t. He’s become very successful in the field. And he takes a similar approach to Jerry Seinfeld. To describe his style to his wife, Seinfeld says “I don’t know what I’m saying.” Oliver agrees with this sentiment, explaining “that you’ll do anything for a laugh like a sociopath.” That, my friends, is what comedy and comedians are all about. Afterward, a discussion revolving around the word “sustainable” fell flat. It wasn’t funny, even though Seinfeld and Oliver were cracking up at the topic. If the episode ended here, it would have been decent. But Oliver got a second wind on the ride home. It started with a discussion about a study on whether you get wetter running or walking through the rain. Apparently, it isn’t better to walk in the rain (The Ronettes lied to me! ), to which Oliver turned on his brand of common sense humor. The rain bit was followed up by the episode’s funniest moment. Oliver says he was staying in a hotel and saw 2/3 of a Key Lime Pie outside another door. He took the pie into his room, ate all of it (it was his first time trying the dessert), and returned the tray to the door, walking away “confidently.” As someone who has never stolen room service before, I found the idea of it as fascinating as the amount of pie Oliver consumed. The return drive finished with Oliver telling a story about his one attempt acting on TV. He was too busy being impressed by the other actors to be a good actor himself. It’s funny because Seinfeld says that’s how he felt during Seinfeld. He deserves some credit for getting a lot better as the show went on, not to mention his style — alongside very accomplished actors like Jason Alexander — helped make the show great. It’s not like his show was Mulaney, and even comparing the two should be considered somewhat blasphemous. 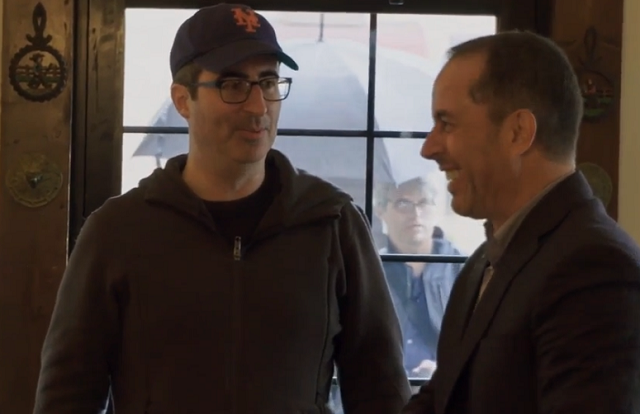 After the second advertisement, Oliver and Seinfeld finally talked about Donald Trump. The GOP nominee is a fascinating individual, especially for comedians, who can mine his jokes like a never-ending supply of bitcoin. The entire bit is funny, but Oliver had the single best quotable line. “He would make a better stress ball than a president, that’s for sure,” he said. I’m actually very impressed Oliver made it as long as he did without mentioning the orange slug.